Gas Grill V-Smoker Box w/ Chips Set | Patio and Hearth Co. 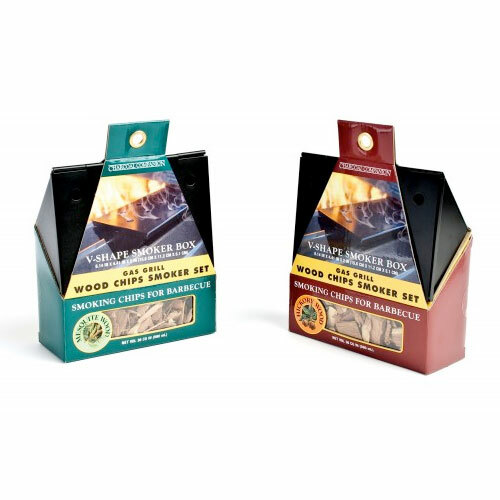 This non-stick V-shaped smoker box comes as a set with 36 cubic inches of Hickory wood chips. Each case contains 3 smoker boxes with hickory wood chips and 3 smoker boxes with mesquite wood chips. Dimensions: Smoker Box:6.14″ x 4.40″ x 2″ Wood Chips: 36 cu. in. Inquire about Gas Grill V-Smoker Box w/ Chips Set using the form below.